In December 2018, developer BioWare teased the next Dragon Age game, hinting at a mysterious future for the popular fantasy series—one that’s enticing, but seems very far away. Why, more than four years after Dragon Age: Inquisition, is Dragon Age 4 still so early in development? The answer is complicated, and reflective of BioWare’s turbulence over the past decade. Last week, we published a lengthy investigation into how Anthem, the new loot shooter from the beloved game studio, went so awry. While reporting on this story and then in the days that followed, I learned a lot more about the current state of Dragon Age, one of BioWare’s two tentpole franchises (alongside Mass Effect, which was put on ice in 2017 following the disappointing Mass Effect: Andromeda but has since been warmed back up). I heard more about the first version of Dragon Age 4, which was rebooted in October of 2017, and the current version, which is now in development at BioWare’s office in Edmonton, Alberta, Canada. But Anthem was on fire, and BioWare needed everyone to grab a hose. The short version: Dragon Age: Inquisition was hampered by a host of problems, including the challenges of shipping on five platforms at once (PC, PS4, PS3, Xbox One, and Xbox 360), the addition of a multiplayer mode to Dragon Age for the first time, and the technical difficulties of Frostbite. Too many people were assigned to work on the game when it first started development, forcing the leadership team to spread themselves thin and make fast, questionable decisions in the interest of ensuring that everyone had work to do (work that they’d frequently have to redo later). Most notably, Inquisition was the product of the “BioWare magic” documented in our Anthem investigation. Much of the design and story was finalised during the final year of development, leading to stress and crunch throughout 2014 as the Inquisition team scrambled to finish the game. By the time Inquisition finally launched in November of 2014, everyone was burnt out. Laidlaw and executive producer Mark Darrah told staff they would try to do things better for their next project, acknowledging that they had made mistakes and telling the staff they didn’t want to shoulder that kind of load again. They said they would focus on delivering an explicit, consistent vision and communicating that vision to the team in as efficient a manner as possible. Following 2015’s critically acclaimed Trespasser expansion, the Dragon Age team split up. 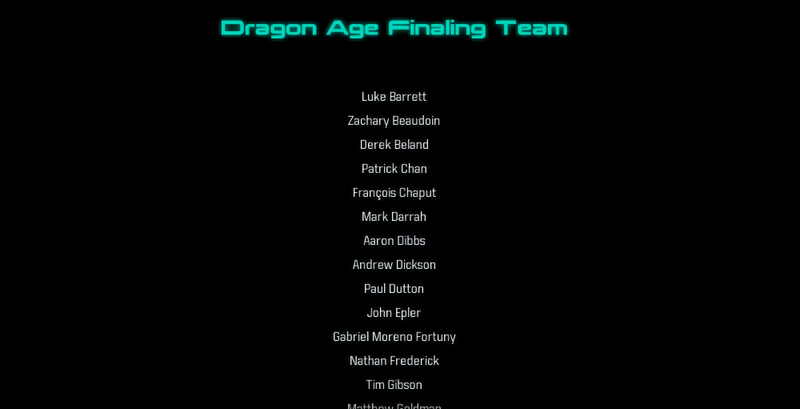 Many of the people who’d worked on Inquisition moved to the troubled Mass Effect: Andromeda, while a few dozen developers including Darrah and Laidlaw started spinning up the next Dragon Age, which was code-named Joplin. The plan for Joplin was exciting, say people who worked on it. First and foremost, they already had many tools and production pipelines in place after Inquisition, ones that they hoped to improve and continue using for this new project. They committed to prototyping ideas early and often, testing as quickly as possible rather than waiting until everything was on fire, as they had done the last time thanks to the glut of people and Frostbite’s difficulties. You’d play as a group of spies in Tevinter Imperium, a wizard-ruled country on the north end of Dragon Age’s main continent, Thedas. The goal was to focus as much as possible on choice and consequence, with smaller areas and fewer fetch quests than Dragon Age: Inquisition. (In other words, they wanted Joplin to be the opposite of the Hinterlands.) There was an emphasis on “repeat play,” one developer said, noting that they wanted to make areas that changed over time and missions that branched in interesting ways based on your decisions, to the point where you could even get “non-standard game overs” if you followed certain paths. A large chunk of Joplin would centre on heists. The developers talked about building systemic narrative mechanics, allowing the player to perform actions like persuading or extorting guards without the writers having to hand-craft every scene. It was all very ambitious and very early, and would have no doubt changed drastically once Joplin entered production, but members of the team say they were thrilled about the possibilities. Once Andromeda shipped in March 2017, it was back to Dragon Age for this team, even as some of them started to sense that Anthem was going to be the next project to turn into an all-hands-on-deck disaster. The Joplin team expanded with people who were rolling off Andromeda and kept working, prototyping, and designing the game. After spending months of their lives helping finish a Mass Effect that didn’t excite a tonne of people, it was nice to return to Dragon Age. One thing that wasn’t discussed much on Joplin was multiplayer, according to a few people who worked on the project, which is perhaps why the project couldn’t last. While BioWare’s publisher and parent company, Electronic Arts, tends to give its studios a fair amount of autonomy, there are still mandates to follow. By 2017, EA had not been secret about its desire to make all of its major products into “games as a service,” best defined as games that can be played—and monetised—for months and years after their release. Traditional Dragon Age games did not fit into that category. Inquisition had a multiplayer mode, but was something like that really going to bring in the long-term revenue that EA wanted from expensive productions like Dragon Age 4? While reporting on Anthem, I kept hearing one interesting sentiment from current and former BioWare staff: They felt like the weirdos in EA’s portfolio, the guys and gals who made nerdy role-playing games as opposed to explosive shooters and big sports franchises. BioWare games never sold quite as well as the FIFAs and Battlefields of the world, so it never felt like they could get quite as many resources as their colleagues at other studios. High-ranking BioWare staff openly wondered: Did EA’s executives really care about narrative? Did they really care about RPGs? Those questions have always lingered, and still do today. By the latter half of 2017, Anthem was in real trouble, and there was concern that it might never be finished unless the studio did something drastic. In October of 2017, not long after veteran Mass Effect director Casey Hudson returned to the studio to take over as general manager, EA and BioWare took that drastic action, cancelling Joplin and moving the bulk of its staff, including executive producer Mark Darrah, onto Anthem. A tiny team stuck around to work on a brand new Dragon Age 4, code-named Morrison, that would be built on Anthem’s tools and codebase. It’s the game being made now. Unlike Joplin, this new version of the fourth Dragon Age is planned with a live service component, built for long-term gameplay and revenue. One promise from management, according to a developer, was that in EA’s balance sheet, they’d be starting from scratch and not burdened with the two years of money that Joplin had already spent. Question was, how many of those ideas and prototypes would they use? It’s not clear how much of Joplin’s vision will shape Morrison (at least some of it will, says one person on the game), but shortly after the reboot, creative director Mike Laidlaw left, as did some other veteran Dragon Age staff. Matt Goldman, art director on Dragon Age: Inquisition and then Joplin, took over as creative director for Morrison, while Darrah remained executive producer on both that project and Anthem. At The Game Awards in December 2018, BioWare teased Morrison with a vague trailer, hinting at the return of the enigmatic villain Solas and promising in a blog post that the team was full of vets. “We’ve gathered our strongest team yet and are venturing forth on the most epic quest ever,” wrote Goldman. When asked, a few BioWare developers agreed that it would be technically possible for a game built on Anthem’s codebase to also have an offline branch, but it’s not yet clear whether Morrison will take that approach. If it does turn out to be an online game, which seems likely, it would be shocking if you couldn’t play the bulk of it by yourself. (Diablo III, for example, is online-only on PC yet can be played entirely solo.) One person close to the game told me this week that Morrison’s critical path, or main story, would be designed for single-player and that goal of the multiplayer elements would be to keep people engaged so that they would actually stick with post-launch content. Single-player downloadable content like Dragon Age: Inquisition’s Trespasser, while often excellent, typically sells only a fraction of the main game, according to developers from BioWare and elsewhere across the industry. Yet this wouldn’t be a “live service” game if it was a repeat of Dragon Age: Inquisition, which compartmentalised its single- and multiplayer modes. Fans in the past have grown outraged at the idea of BioWare putting a lot of emphasis on multiplayer gaming, but there are ways in which a service-heavy Dragon Age 4 could be ambitious and impressive. For example, some ideas I’ve heard floated for Morrison’s multiplayer include companions that can be controlled by multiple players via drop-in/drop-out co-op, similar to old-school BioWare RPGs like Baldur’s Gate, and quests that could change based not just on one player’s decisions, but on the choices of players across the globe. There are other questions remaining, too: With BioWare’s Austin office gradually taking over Anthem going forward, when will the bulk of employees at the company’s Edmonton HQ move to the Morrison team? 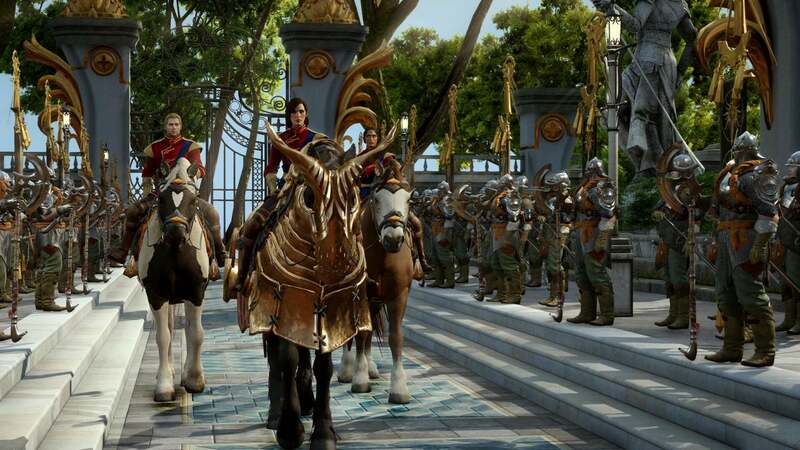 Will Morrison be able to avoid following the lead of Dragon Age: Inquisition, which took on too many people too early and wound up suffering as a result? And, most important, will BioWare work to prevent the burnout that has led to dozens of developers leaving over the past two years, with so many citing stress, depression, and anxiety? Last week, just a few minutes after the publication of our Anthem report, EA and BioWare put out a statement (written before they could have read the article) that was disheartening to some current and former employees and felt almost dismissive of their issues. The next day, in an e-mail to employees, BioWare GM Casey Hudson sent a far more assuring message, promising change “to make BioWare the best possible place to work.” But there have been several recent employee departures, with more (I hear) on the way, and wide-scale leadership improvements may take a long time. The depression and anxiety that has been described by current and former BioWare employees didn’t just result from crunch. It came from people who felt stressed and exhausted, who felt like they couldn’t voice their opinions, who felt like their goal posts were constantly moving, who felt like they’d be targeted for speaking out. These were issues of management and leadership, not just scheduling. In order to protect the identities of employees who spoke to us for the Anthem article, we weren’t able to share some of the saddest and more devastating anecdotes we heard during reporting, but they painted an ugly picture. We’ve also heard questions and stories from other developers who faced the same sort of issues at other big video game studios, who noted that the idea of “BioWare magic” is common across the industry, not just specific to BioWare. We intend to continue tackling these questions and reporting on these stories. We’ll have to see how the next few months and years proceed. If there’s one wish among people connected to BioWare (besides “get rid of Frostbite”), it’s that Morrison will follow Joplin’s lead and not just become a great game, but an example of a project whose leaders are trying to do production right.